Much of the justification for pursuing an outsourced joint venture is predicated on generating a large amount of new income from traded services with other local authorities. In total 71% of the financial improvement is from income growth rather than efficiency savings and of that 60% comes from school meals. Given that school meals is such an important component of the outsourcing package you need to be really sure that the company delivering the service is suitably qualified. "As stated at the Committee meeting in January, the document presented to Committee was an outline business case, which was based on our assessment of the various options for the future delivery of these services and which of those options was most likely to meet the project’s overall objectives. The report made it clear that a full business case, based on the outcome of a procurement exercise, would be brought back to Committee for final approval. It was also made clear to Members that the only true test of the market would come by carrying out this procurement exercise and that proceeding to procurement was the only means of providing certainty over the delivery of the required savings". When we had three bidders for this contract there was an argument that a dialogue might reveal that the business case was completely wrong. That very rapidly became two bidders, Capita and Mott MacDonald. Capita made it clear that they would subcontract out school meals to Compass so at least everyone knew what they were dealing with. This week we found out that this tender competition has become a one horse race with Capita folding, leaving a clear run for Mott MacDonald who trade under the name Cambridge Education. They don't provide school meals services so for the first time this week we found that they would subcontract that element of the business to ISS Catering. Capita who run the two large outsourcing contracts and have the best opportunity for economies of scale have walked away which may indicate that the contract isn't viable. If an in house team had been allowed to bid we would have had a very clear benchmark against which any other bidders could be measured but in Barnet, in-house teams have been refused permission to bid. We are faced with a situation now which is entirely unsatisfactory, exposes the council to significant financial risk and from a governance and scrutiny perspective is inadequate. I also believe that there is a glaring flaw in the entire process. The Barnet business case is for a Joint Venture with Cambridge Education. The largest part of this contract is the school meals service and without that hitting very aggressive growth targets they will fail to deliver the forecast savings. ISS, the school meals sub contractor, is a major player. They will not be part of the JV, merely a subcontractor to it. When opportunities to bid for more school meals contracts arise, say, in Harrow, Brent or Enfield, will ISS forgo a share of their profit to bid for these contracts as part of the Barnet JV or will they bid for them on their own - given they are specialist school meals caterers - and keep all of the profit to themselves. The JV model can only work where the partners are the major service suppliers and that is not the case with Cambridge Education. I forecast therefore that if Barnet enters a JV with Cambridge Education they will never hit the massive revenue growth targets which are predominantly school meals driven and as such they will fail to meet the budget savings required. Consequence - disaster. I call on all councillors to suspend the dialogue process immediately and seek an in house comparator bid to at least provide some form of competition/comparison.I also ask them to reconsider the right to subcontract such a large component of the contract to a third party. If the council continue to push this through with a single bidder with a subcontracted school meals service, then they will have failed in their responsibility to demonstrate best value and in the future that decision will come back to haunt them. Barnet are terribly keen to vacate North London Business Park (NLBP) and Barnet House and relocate to a sparking new office at Colindale. You can read the report here. This will cost £36.3 million to build with interest at 3.34% over 30 years. The report says that in the long run it will save money and we won't have to keep paying rent although my reading of the business case is less clear. I kept scratching my head to understand why they wouldn't remain in Building 2 at NLBP and Barnet House until the full impact of outsourcing all of the council services is clear at which point we might not need the 90,000 sq ft of space in these new offices. Today I happened to be looking through council decisions which are taken by officers and came across this and pennies began to drop. What this tells us is that Barnet have entered into an agreement with Hindale Limited (two directors Brian and Luke Comer) whereby Hindale will pay Barnet £105,364 for officers time to prepare a site development brief and to provide pre application advice to inform the preparation of the planning application for the site. 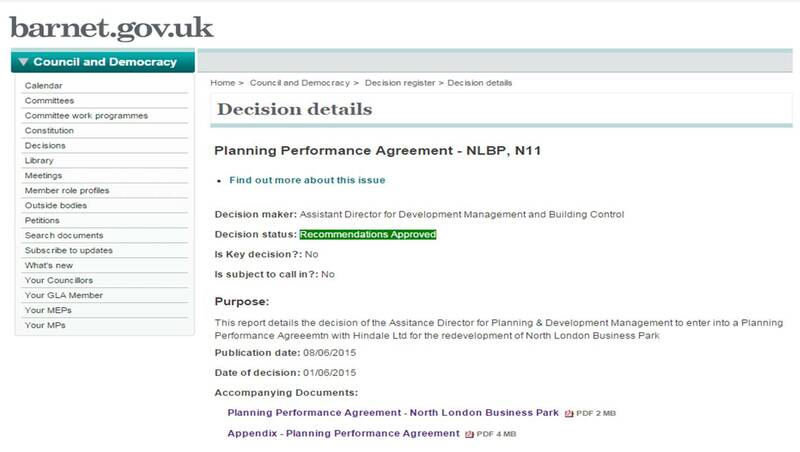 So what you may say - the site is designated as a Strategic Employment Location in the Mayor's London Plan March 2015 so what's the problem. 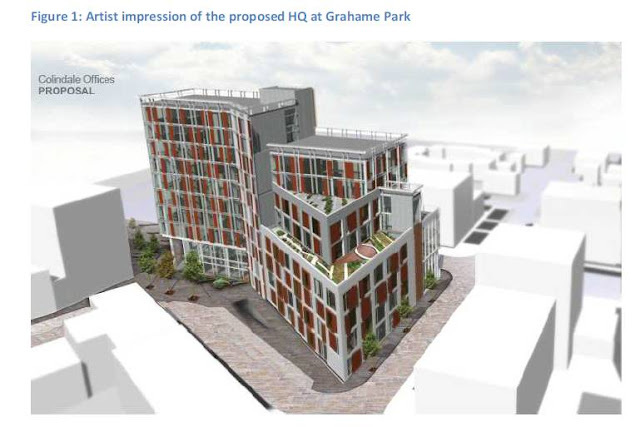 Well the problem is that the proposal is to develop 1600+ homes on the site along with the re-provision of the St Andrew the Apostle Greek Orthodox school. I know new homes are important but so are jobs and the correct balance needs to be struck here. With such a massive potential development why has this decision been buried away on the website. Surely the community should be alerted to what is being proposed and Barnet's apparent desire to assist Hindale/ Comer in this development. There is something very seriously wrong in Barnet. April's supplier payments over £250 saw large lumps sums paid out to the usual suspects. Capita received £6,173,867.16 for both the CSG and Re contracts and Comensura received £1,268,593.60 in just one month. Last year Comensura billed over £15 million for interim and agency staff and based on this invoice it looks like they will hit a similar target this financial year. In addition there were a few of the usual suspect who seem to have been paid rather a lot in April. City Suburban Tree Surgeons were paid £303,266.17 which in one month represents 30% of what they were paid in the whole of 2014/15 (£1,003,311.80). Perhaps this is an area where officers should be looking to make savings. NSL the Council's parking contractor was paid £292,000.51 in April. I am sure Mr Mustard will be scrutinising their payments in some detail. Again the overriding question is, have they really saved money? We seem to have paid out £32,527.96 to Gatenby Sanderson, an executive recruitment agency, for employee expenses. I don't know if this is payments for interims or simply their recruitment fees, but did we really need to spend it? Old 'friends' Impower who along with Agilisys were paid over £8 million to implement One Barnet are back advising the council and in April were paid £32,743, a modest sum based on past experience but are they really needed? I am still waiting for Barnet to take up the challenge of showing where the savings are buried because to date I haven't found them. Today some Barnet Council staff are on strike about the continued outsourcing of services in Barnet. Already we are starting to see the wheels are starting to come off existing outsourced contracts with over grown cemeteries and the "Inadequate" rating given to an outsourced care home (read the damning Care Quality Commission report here). What makes this situation much worse are the entirely dodgy business case reports that have promoted outsourcing as the answer to all our woes. In the original CSG business case it was based on Capita making a major investment in IT because Barnet didn't have the money. Yet once the contract is signed we find the Council advanced a massive capital sum of £16 million to invest in the IT. For the Your Choice Barnet contract, which involved outsourcing adult social care to Barnet Homes, the business case was predicated on generating income from other local authorities which, surprise surprise, failed to materialise. The problem is that much of the justification for pursuing an outsourced joint venture is predicated on generating a large amount of new income from traded services with other local authorities. In total 71% of the financial improvement is from income growth rather than efficiency savings and of that 60% comes from school meals. Given that school meals is such an important component of the outsourcing package you would have thought that whoever put the business case together would have made sure their assumptions were accurate or at least supported by benchmarks. The problem is they have used very generic assumptions, specifically around the profit margin that school meals generate. In the business case they have assumed that school meals generate a 20% margin and the Council's justification for this is that the current service will pick up most of the fixed overheads. However, speak to anyone in school meals and they will tell you that a 20% margin is a complete fantasy and many school meal services just about break even. Indeed Barnet's in house school meals service is well regarded and generates an operating profit of £190,470 on a turnover of £7.1 million or a margin of approximately 2.7%. Having asked the council to tell me what school meal service in the UK operates at a margin of 20% the answer came back none, or rather we don't know. By using a profit margin of 20% that generates a forecast profit of £963,000 it suggests a turnover target of £4.8 million. However, if they have got the margin wrong and it is 5% then to generate the same level of profit they will need to generate £19.26 million of additional school meal sales or approximately 9 million school meals, a huge increase which seems entirely unrealistic. I have brought this to the attention of the council including Richard Cornelius but no one seems particularly concerned. We are being pushed down an outsourcing path, not because it makes financial sense but because of political dogma and anyone who challenges the financial logic is branded a troublemaker. If the outsourcing follows what happened with Your Choice Barnet, where all the promised revenue growth failed entirely to materialise, then the risk is that staff will be forced to take pay cuts and services will be reduced in the same manner as YCB and that is unforgivable.